Inflatable stand up paddle boards are made not only to make recreational water activities better than they already are, but also to make them accessible for everyone. The level of practicality with these iSUPs is beyond what any other board can offer you. From the heart of Surf City Huntington Beach, Atoll released their inflatable boards’ line to answer the call of water enthusiasts for a greater paddling experience. 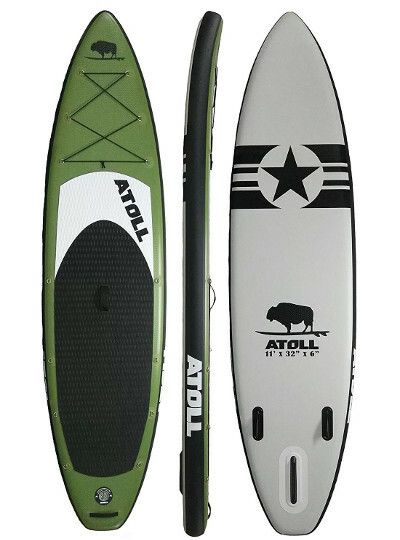 The Atoll 11′ inflatable paddle board represents the pride of this company because as you’ll see, this board is a simulation of the real and authentic value of what a board is meant for. So, let us waste no more time and start with what’s obvious. New sleek 3 piece lightweight aluminum paddle and nylon blade. The Atoll is definitely not a small board; it is 11 feet long, 32 inches wide and 6 inches thick. Those dimensions, at least for me, could be the best given to a board like this one that targets speed and precise performance. I’m not going to lie; this inflatable board looks so much like a hard one it makes me want to thank the company for taking the time and effort to make such a thing happen. Once fully inflated, the Atoll will stand tall with a big personality; one that would want you to embrace the nature, water and your inner paddler who’s going to love how the Atoll feels. The fact that the Atoll iSUP board is 11 feet long makes it a great board for anyone who’s under 6 feet. As for the width, I was really pleased to find that such a sharp iSUP is 32 inches wide which makes a huge difference in water when it comes to stability and balance matters. The same thing could be said about thickness; the thicker the board the better it’ll float and support your body; a 6 inches thick board is actually the best anyone could get nowadays. 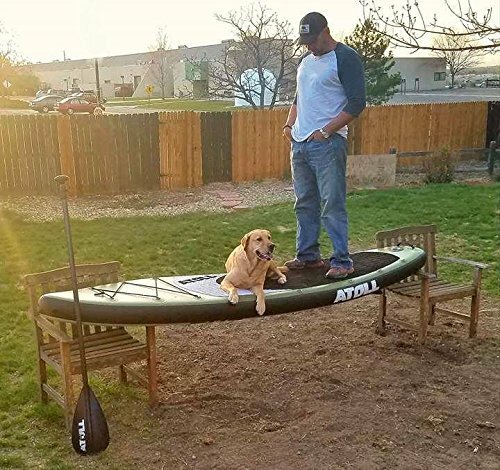 Making inflatable stand up paddle boards is a flourishing industrial domain that keeps growing rapidly thanks to the inventions and technologies used to make those boards better, stronger and more durable. Atoll 11′ iSUP is no difference; the company, like many others, understands that in order to make an indestructible inflatable paddle board which can undertake a certain pressure level in different circumstances and environments; it must be built with the strongest materials available. 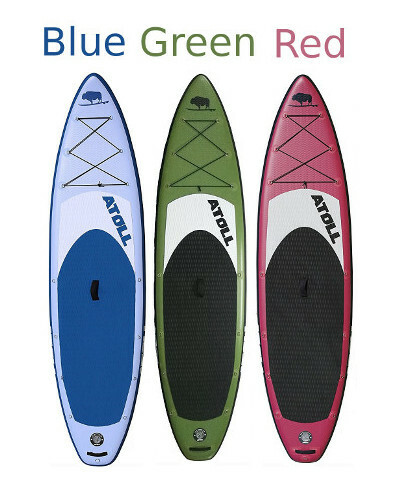 The Atoll inflatable SUP is made of a dual layer PVC that is 30% lighter than comparable models, yet, as strong and durable. Also, the heavy duty drop stitch used to build the board contributes to making it hard and rigid once fully inflated; that way, the Atoll doesn’t only resemble authentic boards in looks but also in feels. The company provides you with two years warranty to cover any workmanship or material defect; that’s how Atoll states that they stand behind whatever has their name on it. The traction pad. This one is a diamond grooved foam pad which covers almost 2 thirds of the board’s back. I think that this feature is quite a vital one for inflatable paddle boards because it makes them stronger and more functional. You’ll also find a set of 15 stainless steel D-rings that come really handy to different riders. 6 D-rings are on the board’s front and are connected with a strong bungee cord, 1 D-ring on the tail while the rest are fixed on both sides. Two carry handles are also featured to help you carry the board after you inflate it; one of which is central while the other is on the board’s tail. The tracking system is crucial when it comes to a board that aims to improve the speed aspect like the Atoll. A trio-fin set is given to this board with the possibility to remove the large central fin for easy packing. A 3rd generation black aluminium paddle that’s made of alloy; it’s adjustable and lightweight with a nylon blade. It breaks down to 3 pieces for travel mode. A 3rd generation high pressure Bravo dual action hand pump. A sleek nylon heavy-duty backpack with mesh sides allowing the iSUP to dry while being stored. A tough 10′ poly flex leash. To start with, I was not even a bit disappointed with how the Atoll performed in flat water. Given its body design, this board is meant to knife through the water with that edgy pointy nose and trapped tail like a knife through a cake. The Atoll is a great choice for long distance paddling or any other activity because I found it to be highly versatile and responsive. It’s also balanced and sturdy thanks to its wide body. However, it’s better recommended for intermediate skill level paddlers since it’s quite sporty. The Atoll comes in a complete and great all-inclusive package. It comes in 3 different colors: green, blue, and red. It’s fast and balanced in flat water. It’s featured with 14 D-rings. It’s given the perfect measurements that’ll suit different riders. It’s made of heavy duty PVC material which is 30 percent lighter. It’s not necessarily a con but beginners might take some time getting used to this board since it targets speed. However, we assure you that like any other board, you’ll find yourself doing just fine after couple attempts and rides.